Despite a shared Buddhist legacy and deep historical connections, Japan and China offer a stark difference in culture and lifestyle. Japan’s orderly, balanced Shinto/Buddhist-centered culture features a meticulously clean environment and an aesthetic known as wabi-sabi, finding beauty in imperfection. China, on the other hand, seems to have an obsession with economic growth and prosperity, with major coastal cities like Shanghai serving as a gleaming 21st century example of the country’s rising power. Two countries with two distinct worldviews and value systems is certainly a fascinating excursion of North Asia. Upon arrival in Tokyo, you will be privately transferred to the Peninsula Tokyo or Aman Tokyo. After breakfast at the Peninsula, you will embark on a full day tour of Tokyo based on your particular interests. The following suggested options, include Tsukiji Fish Market, Meiji Shrine, Akihabara District of Tokyo, Harajuku Area, Yasukuni Shrine (controversial yet interesting! ), and the extraordinary Tokyu Hands Department Store. While in Tokyo, you may even have the chance to attend a sumo match! Upon arrival in Kyoto, you will be privately transferred from Kyoto Station to Hiiragiya Ryokan or Tawaraya Ryokans. With 26 shrines and temples listed as UNESCO World Heritage Sites (most in the world! ), Kyoto is truly one of the most culturally alluring cities on the globe. While staying at either the Hiiragiya or Tawaraya Ryokan, you will be served a kaiseki dinner, representing the highest level of Japanese haute cuisine. Following breakfast, you will enjoy a full day private tour including Heian Jingu Shrine, Kinkakuji Temple, Kiyomizu Temple, and Saihoji Temple. There is nothing casual or fortuitous about a visit to Saihoji Temple and its garden. You may visit by prior appointment only (written request to the administering monks.) Later in the day, you will have the option of partaking in a traditional Japanese private tea ceremony at Ms. Suzuki’s residence. You will begin your day in with the Philosopher’s Walk, a 1.2-mile long path that covers five temples and two shrines, paralleling a beautiful canal/stream. After the walk, you will continue to the Shirakawa Minami-Dori Street in Gion, which has wonderfully preserved wooden structures, with various restaurants and ryokans. In the late afternoon, you will stop at our favorite shops, including but not limited to the Ippodo Tea Company (purveyor of high-quality matcha green tea), and the 400-year-old Nishiki Market. Although we really love Shanghai, it’s hard to beat Hong Kong – the picturesque, deep water harbor is always abuzz with ferries, container ships, and hydrofoil activity. You will be subsequently driven to the Peninsula or Mandarin. Later in the evening, you will enjoy a 90 minute Junk cruise (with open bar) on Hong Kong’s Harbor, one of the most magnificent maritime settings on earth! After breakfast, you will embark on a full day tour with the following options at your disposal: Peak Tram to Victoria Peak, Aberdeen fishing village, Repulse Bay, and Stanley Main Beach (noted for its striking rock formations). Lunch will be served at Repulse Bay and rest of the afternoon is free at your leisure to explore Hong Kong. Following breakfast, you will immerse yourself in the Chinese culture of jade at the Jade Market. Afterwards, you will have the option to venture to ancient Bird Market, Wong Tai Sin Temple, and Nathan Road – the most famous shopping strip in Hong Kong. Depending on your Beijing arrival time, you have the option of a very relaxing jet-lag foot massage en-route to the Rosewood Hotel Beijing. During our last visit to Beijing, we were quite surprised to see a large number of local businessmen and power brokers engaged in one-hour “power foot massages”. Today you will have a full day private tour to experience Beijing. More stoic and perhaps less dynamic than free-wheeling Shanghai, Beijing boasts China’s major historical and cultural attractions. After breakfast, you will meet your guide and driver to for the following stopovers include Tiananmen Square, Forbidden City, Temple of Heaven, Hutong neighborhood (boasting a labyrinth-like layout and “Old Beijing” atmosphere), and Factory 798 (formerly a military factory, now a modern art museum). For lunch, we will recommend one of our favorite Beijing food spots. Your journey to the Great Wall will be second to none as you will visit the section lacking the larger crowds of tourists. You will also be provided with a “Great Wall Specialist” for a comprehensive understanding of the ancient Wall. Another plus of this area is that you have the chance to toboggan ride from the top of the wall to the base! Upon arrival in Shanghai, you will be privately transferred to the Peninsula Shanghai. We feel that Shanghai is a perfect metaphor for China’s future – young, dynamic, optimistic and supremely confident. Today you will have a full day of touring options that include the Science and Technology Museum, Old Town and Yu Garden, Shanghai Museum, Shanghai Urban Museum, and Xintiandi. Today you will start by visiting the Yuyuan Garden, a 16th century Ming Dynasty private garden and residence that remains an oasis from Shanghai’s crowded lanes and teeming masses. Departing this dynastic Ming period masterpiece, you will journey to Xintiandi for high-end restaurant/shopping/entertainment. In the afternoon, you will venture to M50 Art Gallery District and muse over the flourishing avant-garde artist studios. End your day with the Era Acrobats Show (we feel this is very best acrobats show in all of China!). After breakfast, you will travel along the famous coast of Huangpu River to Bund, a foreign hub, and symbol of Shanghai. An hour drive outside Shanghai, you will have discretionary use of your private driver to the ancient water town of Zhujiajiao. The 24-story Peninsula has the best luxury hotel location in Tokyo, directly across from enchanting Hibiya Park (opened in 1903 as Japan’s first Western-style park, the lush, greenery of Hibiya makes it great for a.m. walks and even a 5k run! ), Imperial grounds, and adjacent to the amazing Ginza shopping district. Envisioned by architect Kuzukiyo Sato to look like a giant Japanese stone lantern, the freestanding Peninsula combines subtle Japanese hospitality with the Peninsula tradition of understated luxury. Though we are big fans of Aman in China/Southeast Asia, we initially felt a bit ambivalent about the 84-room Aman in a noisy, urban environment like Tokyo. Located in the 40-story Otemachi Tower, within walking distance of Ginza shopping/dining and the Otemachi Forest (Marunouchi’s Naki-dori tree lined avenue), perhaps the most impressive sight of the Aman Tokyo is its magnificent 33rd floor lobby entrance featuring huge floor to ceiling windows with a view of the Imperial Palace grounds and even Mt. Fuji on clear days(!). The Shoji- lantered area is centered on a large garden and a washi-like ceiling that gives the area a Zen-like Japanese feel. Unlike Aman’s in most parts of the world that ban TV’s in the rooms, the Aman Tokyo includes a flat screen TV for those of us that need a daily BBC fix (!). Similar to Tawaraya Ryokan (just across the alley-way), Hiiragiya is considered among the most noteworthy and famous ryokans in all of Japan. Improbably, two of the most famous luxury ryokans in all of Japan stand directly across from each other! A stay at Hiiragiya or Tawaraya represents a complete immersion into traditional Japanese culture. Enclosed in a traditional sukiya style wooden structure, Hiiragiya was conceived in 1818 when Hiiragiya, a seafood dealer, began providing accommodation to traveling merchants. Later, Hiiragiya welcomed many members of the imperial family including writers/governing officials/international celebrities. Proprietress Akami Nishimura only modestly acknowledges the many celebrities and world leaders who have stayed here (including Charlie Chaplain many decades ago). We give an A+ to both the Tawaraya and Hiiragiya, although we feel Hiiragiya is perhaps more accommodating and open to Western eccentricities. With the Hyatt Regency Kyoto having been the only western 5-star luxury hotel in Kyoto, we were excited about the February 2014 opening of the 134-room Ritz Carlton Kyoto, which we feel is not only the best +100 room hotel in Japan, but perhaps all of Asia. Living in a Mies van der Rohe high-rise in Chicago, we feel a particular affinity to the Hyatt Regency’s simple, clean, architectural design. 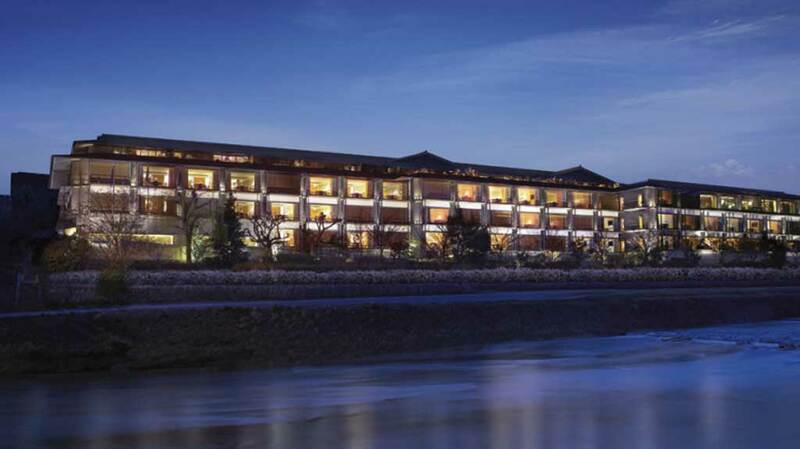 Nevertheless, the new Ritz Carlton’s rectangular, low-slung property, ideally situated in the Kamogawa River, has quickly become the highest quality 5-Star western hotel in Kyoto. Replicating the aesthetics and exterior of a traditional Meiji House, the design and amenities of the Ritz are quite impressive, creating a luxurious sanctuary. Luxury amenities include the best macaroons in all of Japan, a spacious 24-hr fitness center, an EPSA spa, a beautiful 60’ indoor pool, and a French Haute Patisserie. Though we are not big fans of the Ritz global brand (prefer AMAN/Peninsula/Mandarin/Four Seasons) we give A+ kudos for their property in Kyoto! The Ritz Carlton Kyoto perfectly captures Omotenashi, the art of selfless hospitality, a cornerstone of Japanese culture. In contrast to the more grandiose pretension of the Peninsula/Kowloon, the Mandarin Oriental Hong Kong truly represents understated luxury. Whenever we return we are always reminded why we love this property: unpretentious, singular luxury coupled with a very sincere, friendly staff that evokes a home away from home feeling. The 2005 renovation resulted in the new Mandarin’s former balconies being converted to lounge/study area extensions, with stunning Victoria Harbor views. Zen and Sofia especially like the bathroom/amenities, including the vertical, swivel plasma TV/mirrors—so unique! We feel perhaps no other 5 star deluxe property in Hong Kong offers such a luxurious, peaceful oasis from the noisy, frenetic city as the Mandarin: an A+ in our book! The Peninsula Beijing is planning a major renovation in 2016.Though the hotel will remain open during this period, we feel it prudent to use the alternative 5-Star Rosewood Hotel Beijing. Located in the city’s Central Business (Chaoyang) District, across from the iconic CCTV Tower, we feel the 2014-opened 283-room/22-story Rosewood to be among the most impressive 5-Star hotels in all of Beijing. Our feedback from corporate clients staying here recently has been most positive! Meaning to recall the ruggedness of a mountain in order to contrast the serenity that awaits inside, the property’s exterior is quite unique with its Mongolian-sourced bluestone walls (and two spectacular large bronze lions). A commonality of traditional Chinese architecture, you enter the hotel through an ornate inner courtyard. A local Beijing guide we use spoke glowingly about the classical Chinese gardens (completed by a landscaping company from Thailand) that surround the property and the general “hutong” style lobby layout. The Rosewood includes 6 restaurants, a luxury 32,000 sq. ft. Sense Spa, a very nice fitness center and a striking 9,000 ft. indoor pool on the 6th floor. The 800 sq. ft. Manor Suites are preferred. Having stayed at nearly all of the 5-star hotels in Shanghai, we can respectfully proclaim the Peninsula Shanghai as not only the best luxury hotel in Shanghai, but the #1 luxury hotel in all of China! We fully believe the Peninsula on the Bund has no real peer, at least not in China. Although built nearly three years ago, the property is at home architecturally with the 1920s Art Deco and Neo-classical buildings adjacent to the Bund. We particularly loved the Art Deco-emblazoned elevators. Notwithstanding the Art Deco-inspired design, the Peninsula Shanghai rooms reflect the spaciousness and amenities of its sister property in Tokyo. The Grand Deluxe River View rooms are large, over 600 square feet, with impressive 46″ plasma televisions and panoramic views of the Pudong skyline and Huangpu River. Two very convenient amenities include a wonderful Nespresso coffee machine and complimentary VOIP (Voice-Over Internet Protocol) in the rooms – so convenient for calling family and friends back home!